Enjoying the oldest tourist trap in naples. There are two things that Neapolitans all seem to be experts on: espresso and pizza. I have known people from Naples who brought their own tap water north to Italy’s fashion capital because they were convinced that it’s just not the same without their water. The water idea is a bit overblown, but in the right place, I have tasted some of the best espresso in the world here (Bar Mexico in Piazza Garibaldi across from the main train station is one of the best http://wp.me/pfkhI-70 ). The real question is, can we really tell the difference between an excellent neapolitan pizza and a sublimely excellent neapolitan pizza? And if we cant’ get the best, is it really such a tragedy to settle for excellent? For some people living under the shadow of Vesuvius, it is. Which is why they frown on Brandi. Brandi, on a side street of via Chiaia, not far from the San Carlo opera house and the Royal Palace, claims to be the place that made the first pizza named for Queen Margaret of Savoy, Italy’s queen in 1889. The “pizza margherita” is pizza at it’s most basic and essential – dough, mozzarella, tomato sauce, a drop of oil and a few basil leaves to give it the three colors of the Italian flag. Choice ingredients are one of the reasons why it can be so good: buffalo mozzarella from the town of Aversa and tomatoes gown in soil embedded with volcanic ash from Vesuvius are a large part of it. The art of the the few pizzaioli (pizza-makers) who know the exact mixture of flour the best timing for the yeast according to the weather can take whole mix over the top to pizza heaven. Brandi, despite the history, is not considered the pinnacle of pizzerie like olther famous places like Da Michele, Starita and Sorbillo by the pizza lovers I know here. In fact, among many it’s reputation in town is not very good. It appears for years it rested on the laurels of history and the convenience of its location and forgot the pizza part. But other friends her have reminded me they got their act together and have talented pizza makers again. 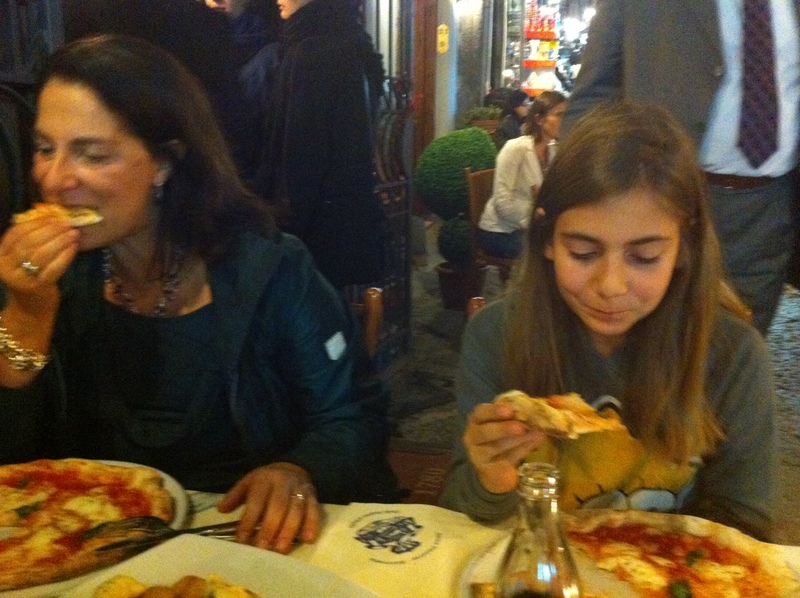 Which is good because the last time my girls were in town with me we happened to be around the corner from Brandi in Piazza Plebiscito just when our sore feet and grumbling stomachs caught up to us. It was early – only 8 p.m. – so we were able to swing the impossible on a Saturday night: the last of the eight little tables outside on the street. 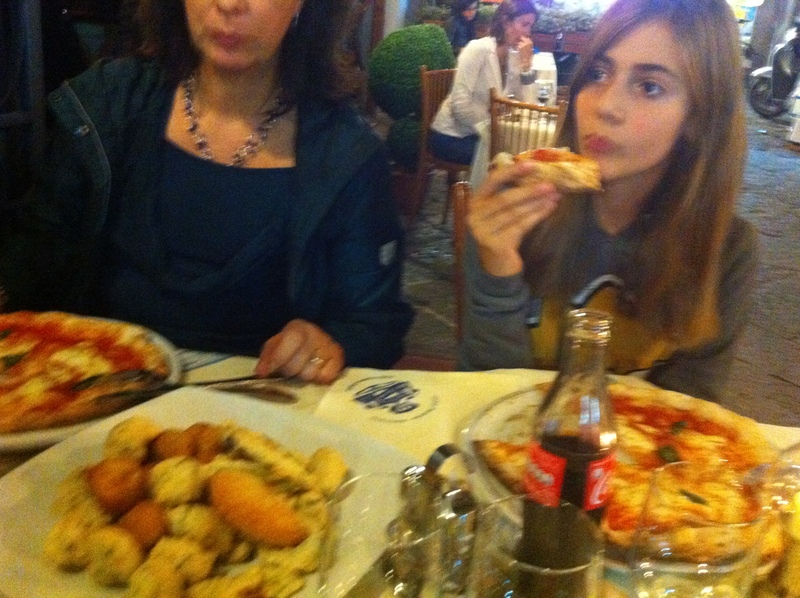 We ordered a plate of fried antipasti and four Pizza Margheritas. The two old men singing and serenading the guests had the place as their official territory, making their presence more friendly and less imposing and, of course, we sang along. The atmosphere was both touristy and authentic, and above all fun. Were we missing the best pizzas the world has to offer? Probably. 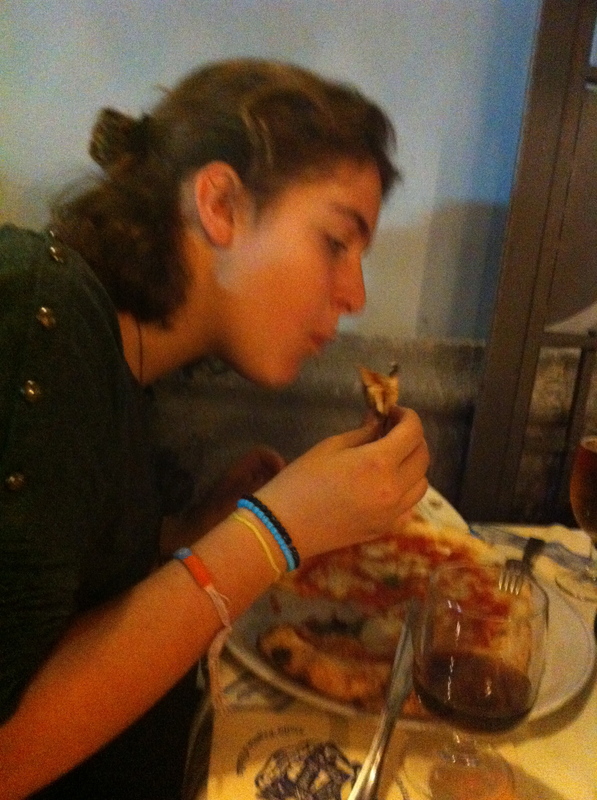 But as we nibbled away at our our excellent pizzas in the cool evening air, we really didn’t care. Antica Pizzeria – Ristorante Brandi, Salita S. Anna di Palazzo (on the corner of via Chiaia) http://www.brandi.it, Tel 081- 416928 Brandi dates back to 1780, but under another name.